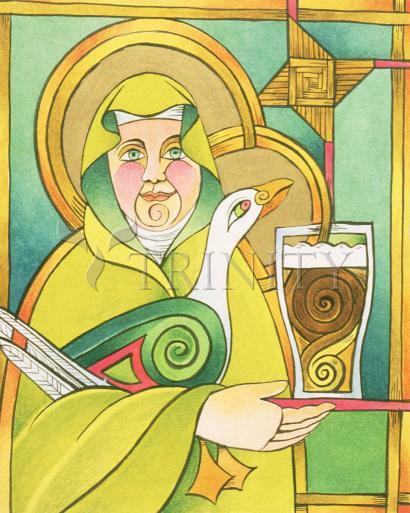 Brigid loved to make beer for the poor every Easter. It was her gift to them in celebration of the greatest of all Christian feasts. Brigid felt we could see the face of Jesus most clearly in the faces of the poor. CEAD MILE FAILTE! As to the scantiness of the records of St. Brigid's life and work, we shall see that certain cataclysms in history interrupted our records; and apart from that, we cite two modern examples. The mighty Santa Teresa of Spain, whom a great nation honours as its second patron, was a nun, like Brigid, whose life was relatively uneventful, but whose influence and whose cult are prodigious. If Santa Teresa had not written her own autobiography and her mystical (Mansions of the Soul), we would know almost as little of her life-story as of Brigid's. Again, that little Carmelite nun, St. Therese of the Child Jesus, who died when scarcely out of her girlhood at Lisieux in our own days, was she not "the Star of the Pontificate" to Pius XI, and has she not won a world-wide cult like Brigid?—yet the acts and deeds of her life could be related in half a chapter. The Catholic mind, therefore, finds no difficulty in realising that a soul may make history and move the world, though leaving little to tell concerning its passage through this world. Our Lady's own life on earth was almost wholly hidden. Finally, ere we pass from Brigid's name to Brigid's story, we must speak of her title, "the Mary of the Gael." This is attached to her in the most ancient records. It can be traced back to her own century, when the legend arose that a Druid prophesied before her birth that she should be "another Mary, mother of the great Lord." It is attached to her, down the ages, in native writings. Here, once again, we are met by the misinterpretations that abound in authors who lack the Catholic way of thinking, and who devise fantastic scientific explanations for things that we find simple. Some of these writers tell us that the old Irish lacked devotion to the Blessed Virgin, but created, as it were, a mental substitute for her in Brigid. They support this theory by citing an old fable in which Brigid is supposed to have been nurse to the Infant Jesus. For us, the fable, which makes Brigid present at Bethlehem five hundred years before her own birth, is a delightful fancy, springing from some poetic mind; but we do not regard our ancestors as fools who believed in impossibilities. We dismiss an argument that could detain nobody save an untraditional evolutionary theorist, and we return to fact. Examining fact, we discover that the olden Gaels reverenced our Lady so devoutly that they did not give her name to their girl children any more than they would give the name of Jesus to boys. They used such names as Maol-Iosa and Giolla-Iosa, signifying servant of Jesus, and they used Maol-Muire ("Myles") and Giolla Muire (Gilmurry), signifying Mary's servant. In modern times, when Mary came into common use and at last, as we have noted, exceeded all other names in the number of baptisms, the traditional reluctance of the Gael to make common use of a sacred name expressed itself in the Irish-speaking districts thus: that girls named Mary in English were called Maire ("Maurya") in Irish, but our Lady never was called Maire; instead, the ancient form Muire ("Mwirra") was preserved, to designate her, and her alone. Now consider what is implied by the former popularity of the name Brigid, far outnumbering Mary, among Irish girls and women, and the description of Brigid as the Mary of the Gael. The phrase puzzles those alien minds which do not know, from the Catholic life, what Mary means to the inner life of the Church. To the mind which thinks traditionally, the phrase is eloquent and illuminating. It could rise only among people who were devoted to the Mother of God. We realise at once that as the old Irish and the Gaels down the ages so reverenced the Mother of the Redeemer that they classed her name with the Holy Name, not to be used freely, so they regarded Brigid, the first Irish nun and the mightiest exemplar of Christian womanhood among their saints, as being the exponent of the virtues and glories of Mary—that is, we may say, as our Lady's representative, the Irishwoman who was nearest to her, truest to her, most like her. The phrase means that, or it means nothing, and nobody with the Catholic way of thinking ever was puzzled by it. As holy women everywhere aspire to resemble Mary and as we recognise our Lady's ways in the sanctified souls of the cloister, so the Gaels saw in Brigid the likeness of our Lady, and called this remarkable Child of Mary, "the Mary of the Gael."